Please wear red polo shirts and black pants or skirts with black dress shoes. Please arrive at 5:30. We are performing in the picnic area. A worker at the main entrance will show you where that is. Please wear red polo shirts with black pants or skirts with black dress shoes, but wear a jacket because it can be cold out there. Performers and one parent get in for free (parent needs a ticket, I will get those to you). Parking is at the Fry’s store north of the Gardens or at Emmanuel Baptist Church southwest of the Gardens. My cell phone is 520-954-6759 if you have any questions. Please wear choir polo shirts with black pants or skirts with black dress shoes. We will leave here from the school at 1:30. My cell phone is 520-954-6759 if you have any questions. This Sunday, October 20, we will celebrate Episcopal Schools Sunday at St. Michael and All Angels Church at the 10:15 service. Students will be participating throughout the service, beginning with our school choir that will sing a prelude. As a parish day school, we are fortunate to have a long-standing relationship with our parish church. Fifty-five years ago, visionary leaders of the church saw the need for a school to insure not only the intellectual growth of children but their spiritual growth as well. Over the years, St. Michael’s has grown in size and in reputation as one of the strongest K-8 schools in Tucson. St. Michael’s, like other Episcopal schools across the country, is a community that honors, celebrates, and worships God as the center of life. We model love and grace, seeking to serve God in Christ in all persons, regardless of their background, origin, or religion, celebrating our diversity within an inclusive environment. School worship is our grounding, offering the possibility to seek clarity about our beliefs and to learn from one another. We are strong because of our community life together. Service learning is also integral to our school culture. Here students learn to reach beyond our own community in order to make the world a better place. As a result, St. Michael’s students build a life that has clearer purpose, meaning, and a sense of service to the world beyond our campus. Beginning with my own high school experience, my life has been deeply affected by Episcopal schools, and it has been a privilege to help carry the mission forward through my vocational ministry. Please join us on Sunday as we honor our identity with Episcopal schools across the country and around the world. It promises to be a memorable morning together. EXTRA! EXTRA! Our Innisbrook Giftwrap deadline has been extended, due to popular demand. If you haven’t already turned in your orders, please do so by this Friday, October 11th. Don’t be left out! Great items, and prices are to be found in the catalog. As always, we thank you for your generosity. If you have any questions, feel free to contact Jessica Huber at Jessica@hubercpa.com. We’d like to thank everyone who came to our Coffee Corner last Friday and made it a great success. Once again, our wonderful eighth graders put on a bake sale and the coffee was provided by the Peña family. Didn’t get a chance to stop in? Don’t worry, we’re doing it again the first Friday of every month, and November will have the famous 3rd Grade bake sale. We’ll see you then! 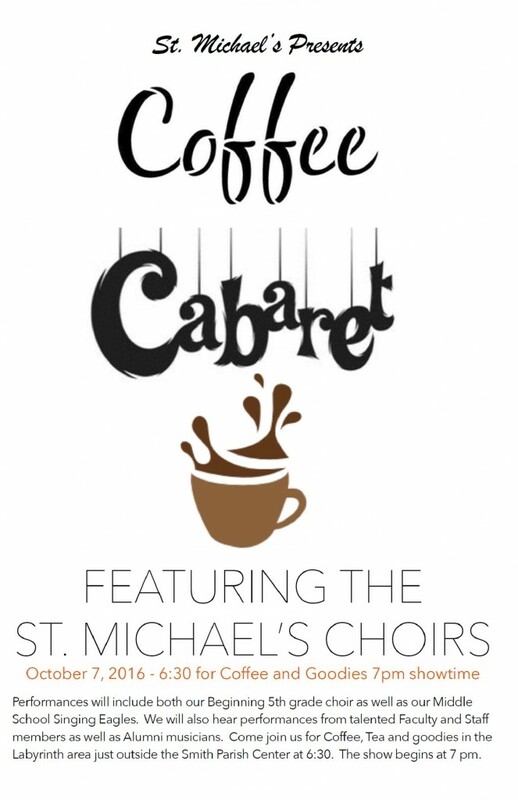 We’d like to give a “shout out” to the Coffee And… Performance, led by Dr. Antista and the Singing Eagles, featuring guest performances by alumni and our very own Mary Redhouse. They put on an amazing show! We’d also like to thank the always amazing volunteers who helped with set up, during the show, and clean up: Hyewon Shin Son, John Pendolino, Felicia Sterling, Kim Greene, Chris Strong, Anabelle Leal-Peña, Catherine Gioannetti, Andy and Amy Bruno, and all the other good Samaritans, who just lent a hand. Bravo! Finally we’d like to invite you to our next SMA meeting, on Wednesday, October 16th, at 8:05 in the Parish Center.